Here's a breakdown of all the changes this month. The 0.3% market share for Oreo isn't impressive, but it makes sense when you think about which phones run it. It's basically Pixels, the last Nexus phones, and a few Sony handsets no one buys. The latest devices from Samsung, LG, and even Motorola are still running Nougat. Still, this is actually the same market share Nougat had in November of last year. Nougat's rollout hasn't been particularly speedy, but it hasn't been that far off the pace set by past versions. In fact, it's still gaining. Nougat saw a 2.8% increase in the last month—one of its best showings yet. All the older versions of Android are down this month—it's just Nougat and Oreo that have gained. Gingerbread has been flat lately, but it inched closer to oblivion in the last month. 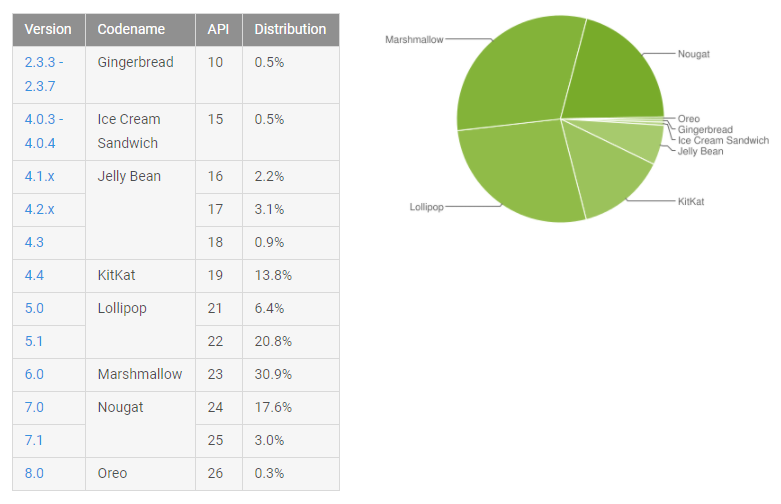 The biggest loser this time around is Marshmallow, which lost 1.1% in the last month. That's probably thanks to people upgrading to Nougat phones. Those on older devices are probably just using them until they break.